What are the differences between an Unsecured Loan and a Secured Loan? Unsecured loan is the opposite of it, which means you don’t put anything on collateral nor sign a personal guarantee to get the loan. If you are not able to repay the unsecured loan, the lender will not be able to issue a lien on your personal or business assets nor sell any of your assets nor put the loan through a collections process. The lender of an unsecured loan will typically right off the loss and just move on. However, depending on the circumstances (e.g. you commit fraud) you can be taken to court for defaulting your repayment under both secured and unsecured lending options. Secured loan requires you to put an asset as collateral and/or sign a personal guarantee, which serves as security for the lender – hence the name secured loan. If you are unable to repay the loan, your lender can file a lien against both your personal and business assets and go through a formal collections process to acquire and/or sell your assets or collateral in order to recoup what’s owed. The lender can also contract with an independent collection agency to assist them in recovering what remains owed on the secured loaned amount. If you own a small business and you need working capital, you will be torn between unsecured loan and the conventional bank loan. However, as a small business it will be in your best interests to go for unsecured loan. Unsecured loans are pretty easy to obtain on the other hand. Unsecured loans have a simple and quick application process. Unsecured loans can be small enough to meet your exact needs, so you don’t borrow more than you can afford. Secured loans are given when you put an asset as collateral or sign a personal guarantee. This poses a bigger risk to you than it poses for the lender. Secured loans from banks can have very long terms. This means you will be in debt for a long time. Secured loans have a long application process. It’s so long that many small businesses don’t go for such a loan due to this. The convenience of applying online and receiving your approval through email makes it even faster than before. There is no specific industry that you would say unsecured business financing is exclusively meant for. However, the nature of unsecured loan makes it more suitable for small businesses. Big businesses have assets that they can put as collateral when obtaining loans. As an owner of a small business, you might not have the assets to put as collateral. If you have a seasonal business, you will find unsecured loans perfect for your needs. During off seasons when you don’t have enough working capital, unsecured loans can help you keep business operations running. A business that sells skiing clothing lineup is a great example of a seasonal business. Businesses in the top 10 industry list are examples of business types that commonly apply for an unsecured working capital loan to grow their business. Each business has their own need and criteria, so the actual loan amount will be different too. As a small business, it can be a mission impossible for you to get a bank loan. First, banks are large organizations and they like to invest in large companies. The loan amount that sounds big to you is meager for the bank. Secondly, there are pages over pages that you have to fill as part of the application process. When you need cash fast, will you have time for all that? And the number of documents bank asks before you can get approved can also be intimidating for you. Take a look at few of the documents and requirements you will have to fulfill before qualifying for a bank loan. So, you collect all the documents only to find out at the end that your application was rejected. How long will it take for the bank to approve your business loan? And are you wondering how long it will take for the bank to approve your business loan? If yes, then keep it in mind that there is no set period. If you have all the documents ready, it might take anywhere around 10 business days to 3 months. If you don’t have all the required documents ready, your loan approval could even take up to 6 months. In many instances you won’t know whether you are denied or approved until the very end, hence wasting months trying to qualify. The bigger the loan amount, the longer it will take for approval. The smaller the amount, the higher the chances will be of getting rejected. Moneck Capital Has The Solution! Call us at 888-405- 3093 or Apply Online to get approved for your unsecured business loan today. 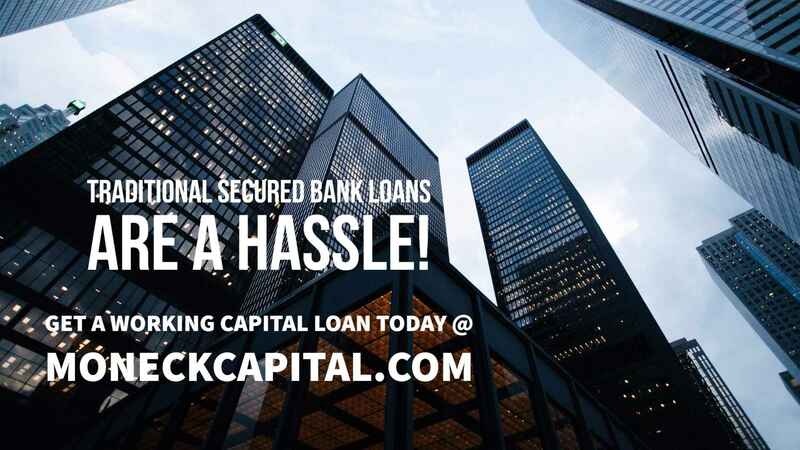 Moneck Capital offers the right financing for small business!